From left: Dallas Geoffrey Cooper, Alex Takeo Fukunaga, Scott Kenzo Mitani and Terren Emerson Mueller. • Dallas Geoffrey Cooper is a graduate of South Torrance High School and has been in Troop 378 since 2009. He joined Scouts as a Bear Cub in Pack 586 and went on to join the troop after his Blue and Gold bridging ceremony. His Eagle project involved building a shade structure, cleaning and repainting interpretive signs along the canyon trail, and re-establishing a footpath in the Demonstration Garden at the George F Canyon Nature Preserve in Rolling Hills Estates. • Alex Takeo Fukunaga is a senior at Palos Verdes Peninsula High School and has been an active part of Troop 378 since 2009. His Eagle Scout project involved the constructing of chairs and table carts and refurbishing a janitorial room at the Gardena Valley Japanese Cultural Institute, a nonprofit community center serving the needs of the local Japanese American community in Gardena. 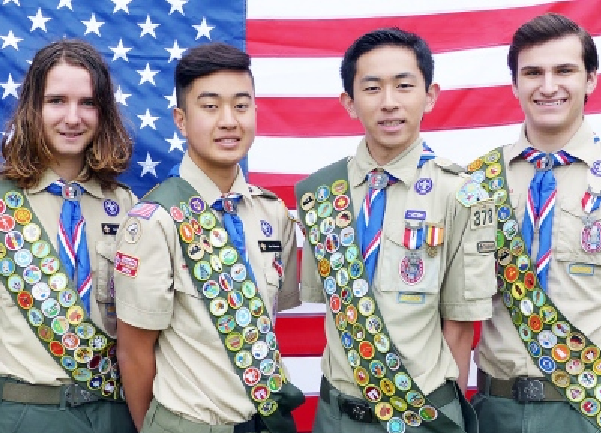 • Scott Kenzo Mitani is a senior at Palos Verdes Peninsula High School and has been an active part of Troop 378 since 2010. His Eagle project involved building vegetable planters and an amphitheater serving the Seed to Plate program, which helps developmentally challenged Palos Verdes Unified School District young adults (18 to 22 years old) learn vocational skills in planting and harvesting vegetables for a local restaurant. • Terren Emerson Mueller is a graduate of Palos Verdes High School and has been in Troop 378 since 2009. He joined Scouts as a Tiger Cub in the first grade and went on to join the troop after his Blue and Gold bridging ceremony. His Eagle project involved building benches, tables and chairs for a new seating area at George F. Canyon Nature Preserve in Rolling Hills Estates, planting drought-tolerant plants and making other beautifications and repairs to the area. The achievements of these four Eagle Scouts were celebrated at an Eagle Court of Honor on Jan. 21.